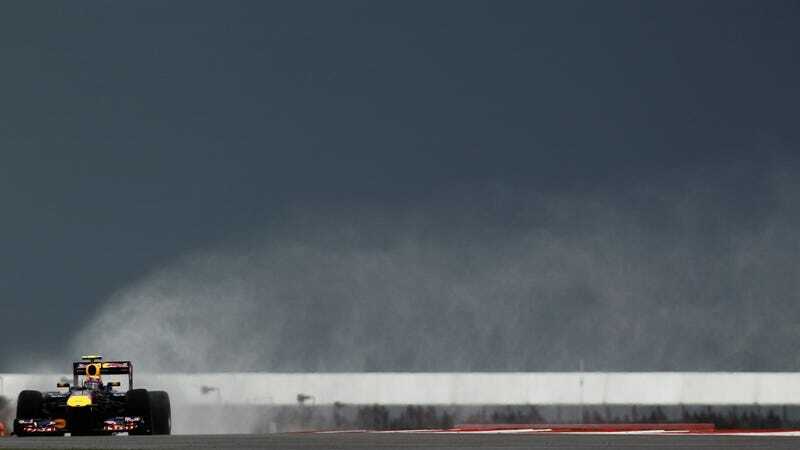 Mark Webber meets good old British weather during free practice. He would qualify on pole, for the 8th time in his career. Fernando Alonso gets ready to race the new and improved Ferrari. Making his debut in Formula One was Daniel Ricciardo from Australia. A Red Bull protégé, he was purchased a seat in one of the Hispanias to learn how to dodge blue flags during an actual race. He has a very impressive nose. Sebastian Vettel should be a terrible person for all his seemingly effortless victories, but it’s little touches like this that make him so endearing: his helmet bears the name of everyone on the Red Bull team. Although McLaren were hit hard by the ban on exhaust-blown diffusers, team principal Martin Whitmarsh and Jenson Button share a laugh before the race. It was not a McLaren race: Button’s pit crew made a mistake, and he ended the race parked in the pitlane, on three wheels. Racing royalty mingle with hereditary royalty. From left to right: 1996 F1 world champion Damon Hill, Sir Jackie Stewart, Prince Harry. The start. Vettel is already away from polesitter Webber. Behind them, Alonso and Button are charging hard, and you can also see Lewis Hamilton beginning his trek from 10th to 4th. Fernando Alonso may have gotten lucky with Sebastian Vettel’s botched wheel change, but he earned his victory on merit: the Ferrari was super-fast all weekend. To make sure Italians will love him forever and ever, the first thing Alonso did after getting out of his car was to point to the Ferrari badge on his steering wheel. The podium. Fernando Alonso is happy. Mark Webber is not happy. Sebastian Vettel is probably world champion. Alonso let his team share in the victor’s champagne.